Check here for IRS Non-Profit Corporation Filing time line. "We are a Native American managed and operated grassroots volunteer charity. We charge no fees for our services. A 100% of all donated goods & supplies reach those in need. Our Members & Staff have agreed to accept no salaries for our work with this corporation. Many Non-profits pay up to 50% of all donations received for just fund raising. We do not pay any fund raising fees either, thereby having more to help our people in need." 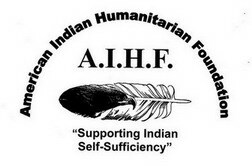 AIHF depends solely on private donations and receives no public monies for our work. July or August 2017, we are preparing to deliver a 26 ft., U-Haul truck of supplies from the San Pasqual Indians to Pine Ridge Indian reservation in South Dakota. Local Indians from San Diego County have donated $500. and the Casino Valley View & Hotel on the San Pasqual reservation has donated funds for shipping to the Southern California AIM where more Indian groups will add to the supplies. From there it will be sent to Pine Ridge. Many India folks are involved with this large shipment. 2016 Tuba City, Arizona, delivered donation to Navajo's by FedEx of clothes, blankets, household items, baby items and clothes, etc. 2 April 2016, Sacaton, Arizona, delivered to Pasqual Yaki Indians FedEx truck of supplies. We are grateful that there are others who commit humanitarian relief (from their hearts) on a worldwide basis have recognized the 3rd world conditions and indigent conditions here in America amongst our nations original native people…. Our donation drives have been to the benefit of Pine Ridge and Rosebud Indian Reservations in South Dakota for many years. Both Reservations are rated the poorest places in the Western Hemisphere next to Haiti according to the Wall Street Journal. Our intended Goal is a long term approach with the emphasis to create a self-reliant environment while implementing short to long term concepts that will someday ignite a new generation of informative native citizens to become responsible leaders for their people that embrace the traditional ideals of honor, integrity, humility and sacrifice, positive values that replace apathy and despondency with hope and purpose. To act and operate exclusively as a public charity, nonprofit corporation pursuant to the laws of the State of Utah, and to act and operate as a community organization which serves to support North American Indians with charitable, educational and cultural programs that advance quality of life while promoting social dignity through relief of the poor, the distressed and the underprivileged resulting in Native North American Indians of all nations achieving self-sufficiency and empowerment within the path of cultural and spiritual traditions.